Tried-and-true, this 2008 Chevrolet Aveo LS makes room for the whole team. Trunk emergency release handle, Tire pressure monitoring system, Safety belts, 3-point, driver and right-front passenger, height-adjustable, includes pretensioners and load limiters, Safety belts, 3-point, all seating positions, rear, LATCH system (Lower Anchors and Top tethers for CHildren), for child safety seats. Knee bolster, driver, Door locks, rear child security, Daytime Running Lamps, Air bags, dual-stage frontal and side-impact, driver and right-front passenger with Passenger Sensing System (Always use safety belts and the correct child restraints for your childs age and size. Even in vehicles equipped with air bags and the Passenger Sensing System, children are safer when properly secured in a rear seat. Never place a rear-facing infant restraint in the front seat of any vehicle equipped with an active frontal air bag. See the vehicles Owners Manual and child safety seat instructions for more safety information.). 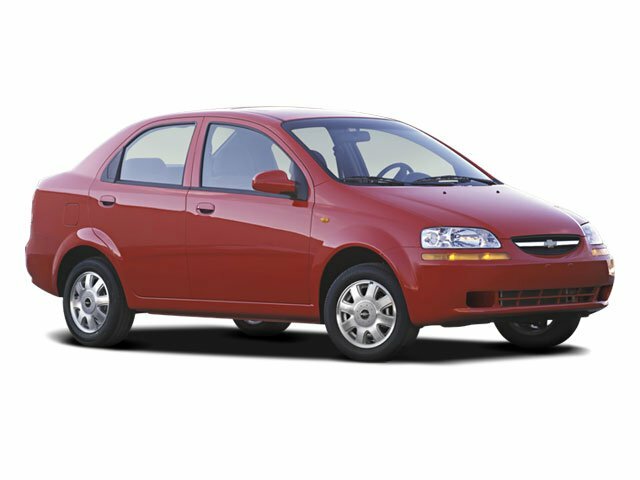 As reported by KBB.com: If you're looking for budget-conscious, efficient basic transportation you'll like the Aveo LT. Practical, utilitarian and with no complicated high-tech systems to learn, the little sedan is also a good choice for RVers looking for a haul-behind car. Another plus: The high seating position for driver and passenger. This Chevrolet Aveo Passed the Test! WHEELS, 14" (35.6 CM) STEEL with full bolt-on wheel covers (STD), TRANSMISSION, 4-SPEED AUTOMATIC includes "hold control" mode, TIRES, P185/60R14 ALL-SEASON, BLACKWALL (STD), SEATS, FRONT BUCKET WITH CLOTH driver and front passenger manual fore/aft, recline and articulating headrests with accessory hook (STD), PREFERRED EQUIPMENT GROUP includes standard equipment, NEUTRAL, CLOTH SEAT TRIM, ENGINE, E-TEC II 1.6L DOHC 16-VALVE 4-CYLINDER MFI (103 hp [77 kW] @ 5800 rpm, 107 lb-ft of torque [145 N-m] @ 3400 rpm) (STD).